In his movie, Tarantino’s talking about building suspense in particular in a couple of scenes. The first one is the opening scene of the movie, in which the movie’s Jewish heroine is hiding under the floorboards of a neighbor’s house in France. An SS agent comes in search of Shoshana and her family. He is able to draw out a confession from the homeowner without alerting the hidden family that he’s found them out. And he’s able to do it because he switches from French, which the Jewish family understands, to English, which they don’t. Here’s a clip from part of that scene, after Landa has switched to English. SS Col. Hans Landa: You are sheltering enemies of the state, are you not? Col. Hans Landa: You’re sheltering them underneath your floorboards, aren’t you. Col. Hans Landa: Point out to me the areas where they are hiding. [LaPadite points with his pipe; Landa walks over and stands on top of that area, gesturing with his own pipe for confirmation] Since I haven’t heard any disturbance, I assume that while they’re listening, they don’t speak English. Col. Hans Landa: I’m going to switch back to French now. I want you to follow my masquerade, is that clear? Another scene, probably the most suspenseful of the whole movie, is at a German bar behind enemy lines. A group of Allied soldiers are meeting an informant (Frau Hammersmark) there, but they’re interrupted by a nosy SS officer. He becomes suspicious of the undercover Allies by detecting subtle differences between the accent that the British officer speaks German with. He doesn’t ultimately discover the man’s nationality, though, until the Brit asks for “three glasses” using the British/American hand signal for “three” (index, middle, ring fingers), instead of the German one (thumb, index, middle). The idea of using linguistic data as a sort of defense goes back to biblical times and the story of the Shibboleth. One side in a war couldn’t pronounce the sh sound at the beginning of the word shibboleth, pronouncing it instead as sibboleth. This alerted the other side that they were dealing with their enemies. Gilead then cut Ephraim off from the fords of the Jordan, and whenever Ephraimite fugitives said, ‘Let me cross,’ the men of Gilead would ask, ‘Are you an Ephraimite?’ If he said, ‘No,’ they then said, ‘Very well, say “Shibboleth” (שבלת).’ If anyone said, “Sibboleth” (סבלת), because he could not pronounce it, then they would seize him and kill him by the fords of the Jordan. Forty-two thousand Ephraimites fell on this occasion. Anyway, I think that Tarantino makes a good point–as he says, I don’t buy that Clint Eastwood speaks perfect German. Those differences in language should be exploited to make a better movie…though I hope our military isn’t taking any cues from Brad Pitt as Aldo, trying to speak Italian. Hawaii is generally pronounced by non-Hawaiian Americans as /həˈwaɪ.iː/ (huh-WHY-ee). Many Hawaiians and more adventurous mainlanders pronounce it /həˈwaɪʔiː/ (huh-WHY ‘ ee), adding a glottal stop (the same sound as the hyphen in uh-oh) between the last two syllables. Pretty straightforward, right? Somebody please tell the ESPN play-by-play guy at the CU-Hawaii game that Hawaii is not pronounced “Hava-ee.” It’s not a German word. To be fair, I would be pretty annoyed if someone kept unnecessarily Deutsching a common term, too. But maybe the ESPN guy knew something my friend and I didn’t. So I did a little research. So apparently the ESPN guy was kind of right. Huh? According to Wikipedia, in the Hawaiian language, the state is actually sometimes pronounced with a /v/ sound, /haˈvaɪʔiː/. Okay, to be fair, plenty of languages conflate the two sounds /w/ and /v/ (like most Indian languages, which only have one character for both sounds), so maybe something like that is going on here. The first grammar of the Hawaiian language was written by a German missionary, Adelbert von Chamisso. The letter “w” in German represents the sound /v/. 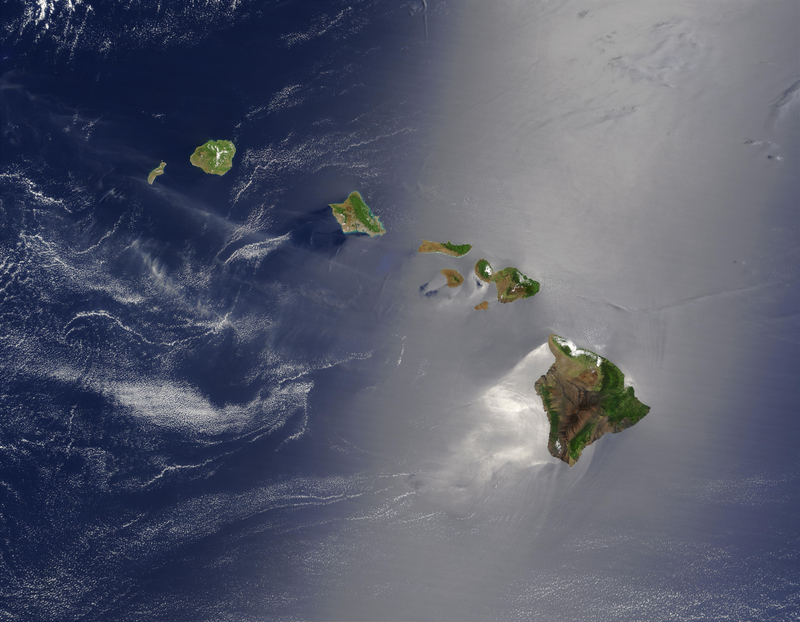 Hence, Hawaii would have been pronounced Havaii in German even though it was spelled with a “w.” And if German chose “w” to write the name of the language (“Hawaiische sprache”), maybe they were indeed faithfully documenting the native sound. But we can’t always take the British pronunciation at face value. They did, after all, mangle India’s “Mumbai” to “Bombay” and “Thiruvananthapuram” to “Trivandrum” (okay, I dont blame them for the second one). Transliterating between languages, especially when one of them isn’t a natively written language, is an inherently unstable activity. Awkward changes are bound to occur. Why must you tease us with your Vs and Ws, Germany? Why?! My suspicion is that the rogue /v/ pronunciation arose because some languages, like German, pronounce “w” as /v/. And because “Havaii” might sound more “exotic” than “Hawaii,” some people might have automatically assumed that the /v/ pronunciation was the indigenous one. Even if “Havaii” is the correct, indigenous pronunciation, we might as well discard it altogether because “Hawaii” is the predominant pronunciation out there in English. After all, the pronunciation of American place names has changed a lot over time anyway. Think about “New Mexico” — pronounced /ˈmɛksɨkoʊ/ “mek-si-ko” not the Spanish /mexiko/ “me-hi-ko.” Or Louisiana — /luːˌiːziˈænə/ “loo-easy-anna” not the French /lwizjan/ “lweezyan.” Or pretty much any place name derived from Native American languages. English is remarkably devastating in its alteration of other languages. And when a placename has been so totally assimilated into the language and culture, such as in the case of an American state, the popular pronunciation is the real pronunciation. This belief that popular usage and pronunciation is more important to teach and learn (in other words, bottom-up linguistics) than prescriptive usage (top-down linguistics) is called descriptivism. It’s unclear whether the ESPN guy was pronouncing “Hawaii” faithfully or not. In terms of descriptivist English pronunciation, he was wrong. Either way, I’m guessing Hawaii’s fans don’t care which way the ESPN dude pronounces it as long as they win. I think I need to do some more on-location research. I have done some on-location research (i.e. I’ve been to Hawaii on vacation) and a lot of Hawaiians do pronounce it with /v/. They also pronounce some place names, like Haleʻiwa, with /v/. I should add I’m not talking about native Hawaiian speakers. I never met any native Hawaiian speakers. Chamisso a missionary? He was a Romantic poet and translator of troubadours. He wrote the tale of Peter Schlemihl who sells his shadow to the devil. He was also a botanist, many plant species are named in his honor. He said of himself, “I am a Frenchman in Germany and a German in France, a Catholic among Protestants, a Protestant among Catholics, a Jacobine among aristocrats and a nobleman among democrats, a freethinker among the pious and a bigot among the prejudice-free… I belong nowhere, everywhere I am the stranger.” That might have made him a missionary everywhere he was or went, but certainly not in the sense you imply. He came to Hawai’i as a botanist and stayed for a month. The missionaries arrived later. Okay, time for the classic. [v] is also the norm after /i/ and /e/, whereas [w] is usual after /u/ and /o/. After /a/ and initially, however, [w] and [v] are in free variation. Citation given, in case anyone cares to verify.